A couple of days ago we tried our first recipe from Bobby Flay's Mesa Grill Cookbook. Since it's so cold outside, a soup sounded like a good idea. We made Chicken and Mushroom Posole Soup. The soup is very simple to make, all in all probably taking an hour or less, with most of that time allowing the soup to simmer or vegetables reconstitute. We had a little trouble finding the ancho chilies; surprisingly no chain grocery store in town had them. Zac finally found them at an Hispanic grocery store in Montgomery about 25 minutes away. The porcini mushrooms also were hard to find, but a local Publix ended up having some in stock. We followed the recipe and oven roasted the boneless but skin on chicken breasts. I bought bone-in chicken breasts and simply removed the bones. You could also use leftover rotisserie chicken. Most of the ingredients from our local Publix. This was our first hominy-cooking experience. It made the soup very hearty. We also used our enameled cast iron pot for the first time too! It's 7-quart, quite heavy, but destined to get used quite a bit. Here we are bringing chicken stock up to a boil. After the chicken stock was boiling, the chilies and mushrooms were added, and simmered for a few minutes. Then, the chicken, herbs, and hominy were added and left to simmer. Then it's time to plate! The soup is topped with chives, a squeeze of lime, white cheddar cheese, and blue tortilla chips. The recipe includes instructions on how to make your own blue corn tortilla strips, but we opted for the store bought chips to make our life a little easier. It worked out well. 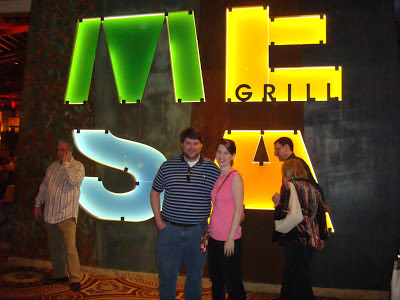 Looking forward to making more recipes from our Mesa Grill cookbook!